Butterflies are one of the most sensitive indicators of climate change. Their flight periods can shift from year to year and location to location based on local temperature profiles. 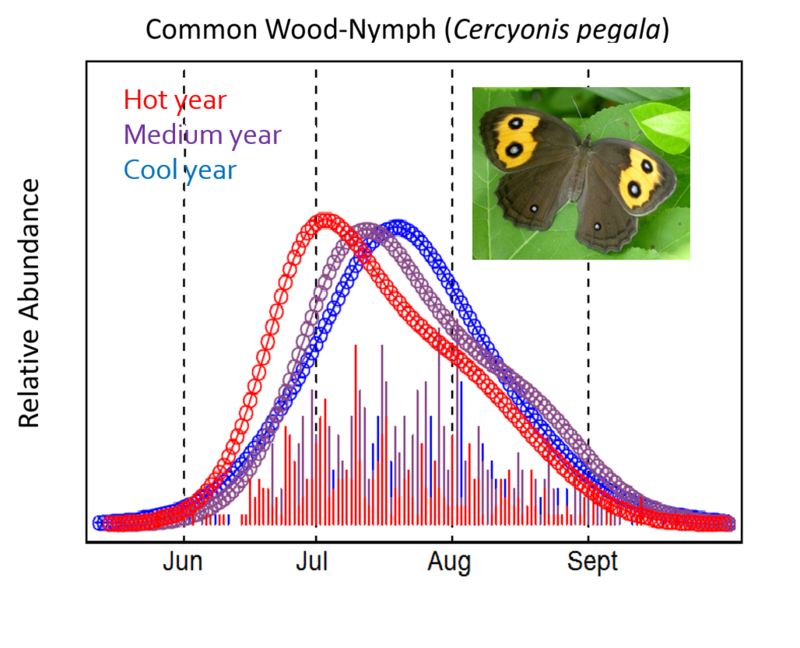 We are working to build predictive models of butterfly phenology based on temperature and determine which species are most likely to respond flexibly to shifting weather conditions based on their ecological traits. Two recent papers explore this topic. One simply asks for what species temperature is a better predictor of emergence and distribution compared to date (Cayton et al. 2015). The other explores what happens when climate warming combines with urbanization (and associated “heat island” effects) to exacerbate temperature extremes (Diamond et al. 2014). This study showed that while many species showed phenological advancements (emerging earlier) during hotter springs and summers, when combined with heat island effects, delays became more likely. Delays may indicate physiological stress from excessive heat. Species that showed these effects were more likely to be forb feeders and overwinter as pupae suggesting that traits may be important predictors of variable responses to climate.